Dry Contacts Providing AC Output Frequency Switch Between 60Hz / 62.5Hz - Shenzhen Sigineer Power CO.,LTD. This Sigineer Power 15KW inverter chargers are designed with a 2 pin dry contact on the upper side of the negative DC post. The Dry Contacts Provide Frequency Switch Between 60Hz / 62.5Hz as the secondary charge control of on grid inverter . It can control excess energy back feed from the grid tie batteryless inverter when the battery bank is charged to a voltage within the manufacturer’s limit. To accomplish this, you can use a relay to create a short circuit to the dry contact pins to switch the output freq from 60hz to 62.5Hz, shutting off the grid tie inverter system and preventing the battery from overcharge. This dry contact is not designed to carry/withstand any voltage, it only accepts a nill voltage short circuit applied on its 2 pins. Inputting any voltage on the dry contact could permanently damage the inverter and invalidate the warranty. It works in junction with SW4 DIP switch and overrides the original SW4 function in the manual. Pls refer to the below lines for the actual operation of SW4. 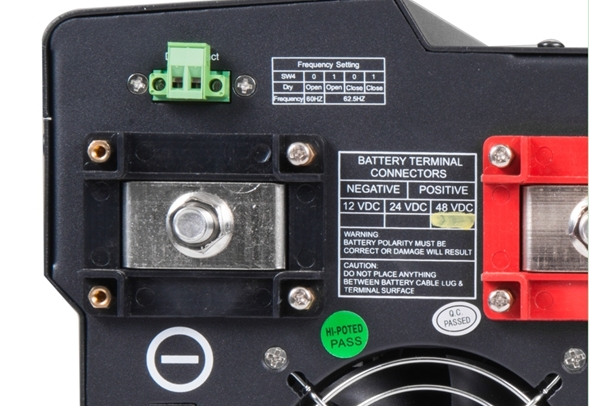 The inverter will output 60Hz when SW4 @ “0” and Dry Contact is Open . It will output 62.5Hz when SW4 is set to “1” or the dry contact is closed.